There are over one million visitors to island each year. Visitors outnumber island residents 1,000 to 1. 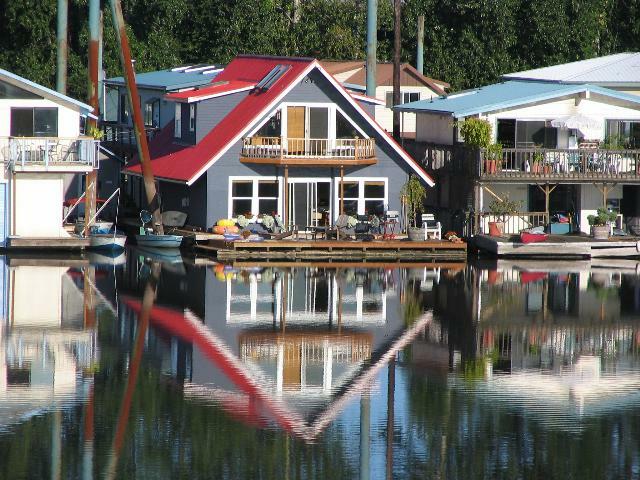 Sauvie Island Moorage located on the Multnomah Channel have approximately 44 floating homes. M ayfair Moorage, located on the Multnomah Channel have approximately 17 floating homes (few can be seen left). Big Island Marina is tucked between two above houseboat moorages on the Multnomah Channel. It has 14 slips of which three are full-time live aboard. Portland Yacht Club’s moorage facility. This Willow bar outstation is designed to handle about 60 boats. Located on the Columbia River it is for members only and for short term stays. – will take the sailor on a 50-mile trip! There is only one bridge providing access to the island; at least one at a time. 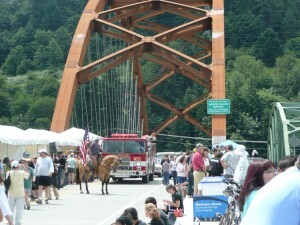 The photograph below shows the one-time exception when the old 1950’s Sauvie Island bridge stood, on its last day serving traffic and before it was disassembled, next to the larger one that replaced it in 2007. Island residents on opening day celebration.